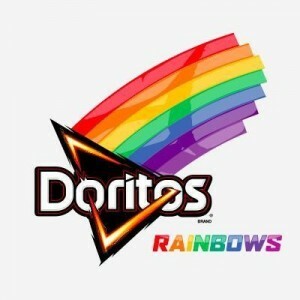 PLANO, Texas – The manufacturers of Doritos potato chips say they have “had an amazing response” to their homosexuality-celebrating Doritos Rainbows chips, but some consumers have promised to never buy Doritos products again because of the company’s support of sin. The Doritos brand, a subsidiary of Frito-Lay, Inc., has announced in a press release that their company will be offering bags of limited edition, rainbow-colored potato chips. The purpose of the chips is “to celebrate and support the lesbian, gay, bisexual and transgender (LGBT) community in the boldest, most colorful way possible,” according to the release. “Introducing Doritos Rainbows chips, the first Doritos product in history made up of multiple, rainbow-colored Doritos chips inspired by the pride flag,” the company announced. “With Doritos Rainbows chips, we’re bringing an entirely new product experience to our consumers to show our commitment toward equal rights for the LGBT community and celebrate humanity without exception,” he said. Frito-Lay offered the multi-colored chips to consumers who donated at least $10 in support of the It Gets Better Project—an activist organization founded by Dan Savage, an open homosexual. Savage is a controversial public figure who has repeatedly castigated the Bible and Christian political candidates. “We’re honored to partner with the Doritos brand to celebrate the momentous progress that has been made toward equal rights for the LGBT community in this country,” stated Brett Peters, communications director of the It Gets Better Project. “Awesome, now I have a reason to never eat Doritos again,” one commenter stated. “I won’t be buying Doritos again,” another wrote. Doritos is not the only national food company to support the homosexual lifestyle by offering special products to their customers. As previously reported, Burger King unveiled “The Proud Whopper” last year at one of its San Francisco locations. Corporate executives at Chipotle and Starbucks have also publicly expressed support for homosexuality. As also reported, a Christian evangelist and apologist established Sept. 13 of each year as “Mercy Day”—a time for Christians to celebrate the mercy of God and remember the original meaning of the rainbow, as described in Genesis 9:13.